01:32 — Doctor Who: ‘Day of the Doctor’ dominates! 04:04 — Doctor Who: ‘Legacy’ mobile game now out. 05:35 — Doctor Who: Daily Mail review. 11:03 – Doctor Who: The Day of the Doctor. 30:44 – Doctor Who: An Adventure in Space and Time. 44:10 – Doctor Who: Celebration. 82:18 – Farewell for this podcast! 83:11 — End theme, disclaimer, copyright, etc. Google: Doctor Who 50th Anniversary Doodle. Facebook: Doctor Who Legacy mobile game. Tiny Rebel Games: makers of Doctor Who Legacy. BBC: An Adventure in Space and Time. 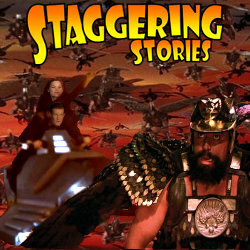 Wikipedia: An Adventure in Space and Time. Jean Riddler’s Doctor Who Celebration Flickr Photo Set. 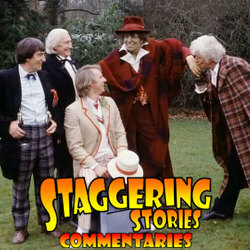 Adam J Purcell, Andy Simpkins, Fake Keith, Jean Riddler, the Real Keith Dunn and Scott Fuller sit down, mind probed, in front of the 1983 Doctor Who anniversary special, The Five Doctors, and spout more than our usual nonsense and generally get in the mood for the Doctor Who 50th Anniversary! Warning: This commentary is at least three times more boisterous than our average effort. Do not listen if you have a history of mind probing in your family or you have ever lost a beloved pet yeti in a freak fireworks accident. BBC: Doctor Who – The Five Doctors. Wikipedia: Doctor Who – The Five Doctors. 01:52 — Star Wars: LucasArts – DEAD! 03:57 — Misfits: DEAD! (soon). 05:34 — Iain (M) Banks: Dying. 07:17 — JMS: Sense8 coming to NetFlix. 08:59 — Blake’s 7: Syphy contracts the reimagining. 11:53 — David Tennant: Awkward scenes in The Politician’s Husband. 14:29 – Doctor Who: The Bells of Saint John. 24:54 – Nanny Ireland: The Agony Nanny. 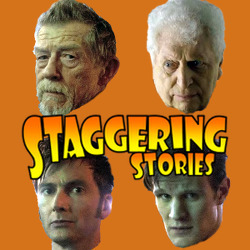 26:40 – Doctor Who: The Rings of Akhaten. 40:09 – Convention reports: Dalek Invasion of Portsmouth 2013AD and Big Blue Box 2. 106:13 – Farewell for this podcast! 106:43 — End theme, disclaimer, copyright, etc. Wikipedia: Doctor Who – The Bells of Saint John. Wikipedia: Doctor Who – The Rings of Akhaten. Facebook: Dalek Invasion of Portsmouth. Facebook: Big Blue Box 2. YouTube: The Gurrier Brother’s “The Wizard”. 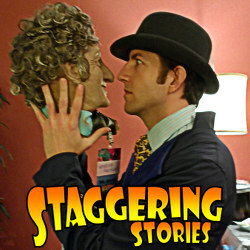 Staggering Stories Podcast #136: Staggering Stories Live 2012! 03:05 — Doctor Who: Caroline John – Dead! 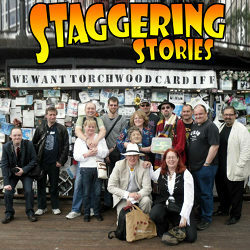 04:46 — Staggering Stories: We invaded Cardiff – Live! 06:68 – Doctor Who Trivia Smackdown. 35:55 – Fight Club: Jean vs. Fake Keith. 37:57 – 30 Second Recommendation: Kate Griffin’s The Minority Council novel. 41:12 – Farewell for this podcast! 42:03 — End theme, disclaimer, copyright, etc. Kate Griffin: The Minority Council.